Description: Asp emplacements on Cobra Island are on high alert after a Sky Striker fleet was spotted miles away by a Battle Barge. I didn't realize the RLA Cobra was such a light blue. There isn't much material on him out there. Excellent shot of them all together. All that classic Cobra blue looks great together! Plus, I love scenes that take place 'on Cobra Island'! Sweet shot! Nice army and the setting is great too. If Battle Barge's were easier to find, I'd buy one. Awesome scene and dim lighting! There aren't many shots of this guy floating around. This shot is amazing. I love the dude with the radio. What's that accessory from? Thanks DF! 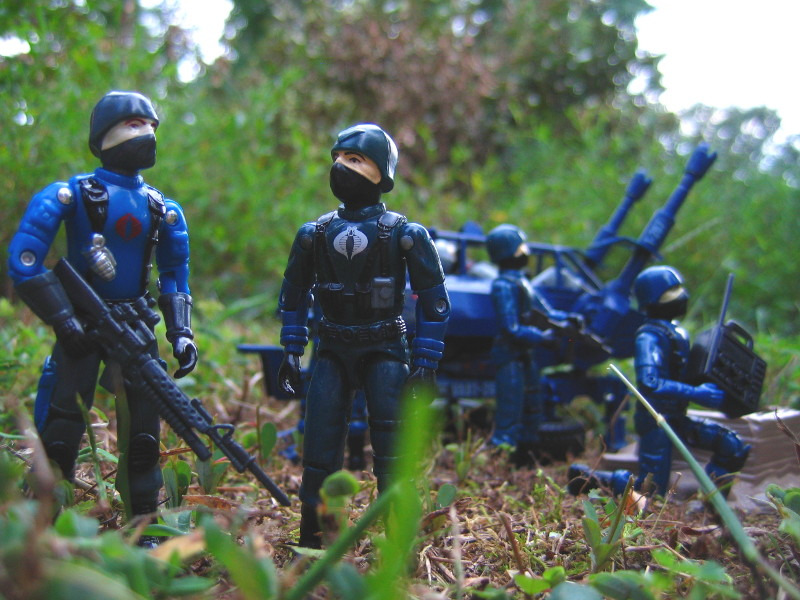 The radio is from the Cobra Night Landing, the 50th one to be exact. Also, using the Battle Barge as a satellite sounds like a rad idea.